Can you use a sunscreen under makeup? Or wear a sunscreen and a foundation with SPF at the same time? And what about a primer, moisturizer, and foundation if they all contain sunscreen, too? The answer will surprise you. Step up your sunscreen savvy. Get the truth about mineral versus synthetic sunscreen ingredients, and find out which is ideal for your skin type. You probably know you need to apply sunscreen daily, but do you know how to apply it so you get the protection your skin needs? 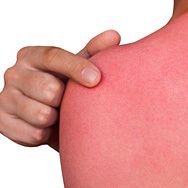 Misapplying sunscreen is a mistake most people make! We’ll help you "see the light!" Learn about the best self-tanners, how to prep skin, and application secrets from our pros in this must-read guide to a flawless faux tan. The sun emits two types of rays that reach Earth and affect your skin. We explain how they differ and how sunscreen actives work to protect skin from visible effects of aging and more. Water-resistant sunscreens are a must when swimming or perspiring outdoors, but applying them correctly makes all the difference in the world. We explain everything you need to know so you can safely have fun in the sun.